According to IBM’s 2011 Annual Report, by September 2015 fully 50% of IBM’s profit is expected to come from its software group (SWG). On the surface, this is surprising, because software is a distinct minority of IBM’s total revenue. In 2011, SWG’s $25B represented less than a quarter of IBM’s revenues earned. Here is IBM’s revenue broken down by business unit (Finance and Other are omitted here). While software’s contributions to IBM’s bottom line have grown over the last seven years, software is less than half (23%) as valuable from a revenue standpoint as services (56%). Which, absent the profit narrative, would raise questions about the ultimate importance of software to IBM’s business. But revenue is a rough metric, one that neglects the costs of generating that revenue. When profit margin is taken into account, it’s at once easier to understand and appreciate the importance of IBM’s software group, and the longer term goal of having that unit generate half of IBM’s profits. Here are the reported gross margins, by business unit, over the same span. 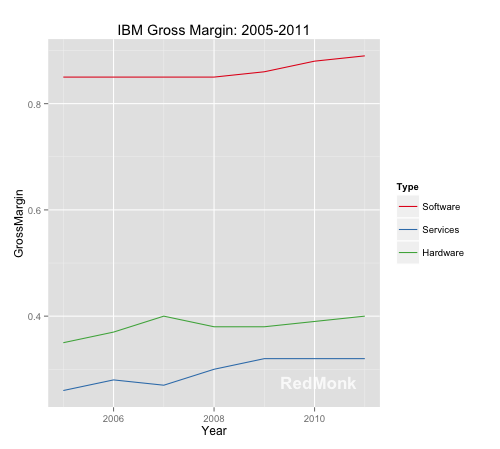 In 2011, IBM’s reported gross margin for software was 88.5%. The actual number is less important than the context, because gross margin can exclude important and substantial costs such as sales. But whatever the actual margin realized on the product, software is more profitable – by a lot – than IBM’s other businesses. If we apply the reported gross margins to the individual revenue streams, here is each business unit’s respective contribution to IBM’s profit. It is not, on balance, surprising that software’s contribution to profits are outsized: software scales better than people. 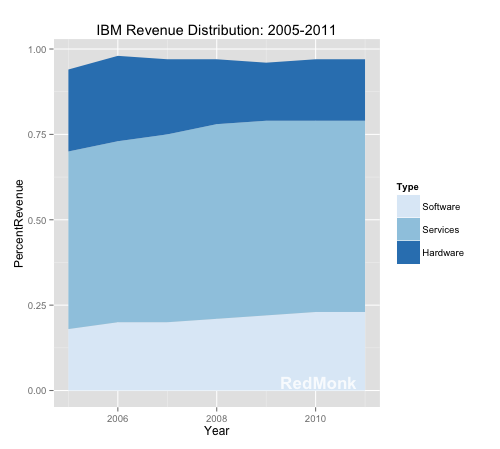 But software is also more profitable at IBM than at many competing software businesses, which is more interesting. The sustained growth of reported margins is also worth noting; with the exception of 2007, when they held flat, IBM’s software margins have grown every year since 2005. This is true for neither of the two other major BU’s. What we don’t know about IBM’s software business, however, may be the most important trend. Unlike Oracle, IBM does not appear to split out new license revenues from existing sales, support and service contracts. This means that while IBM’s growth is evident, the actual mechanisms are less so. At Oracle, software revenues are on a similar trajectory, but new licenses as a percentage of overall revenue are declining. If the same is true of IBM, it could be cause for concern. In answer to the larger question of how important software is to IBM, it’s clear that SWG is core to the business moving forward. Its unique-to-IBM ability to extract outsized profits is the foundation upon which the company’s profit growth depends. Strengths, however, can also represent weaknesses if they open doors to disruption. 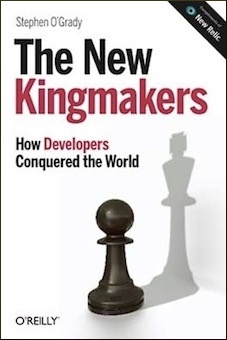 In IBM’s case, it’s important to consider the wider market context. Across a wide variety of software segments, the evidence suggests that the realizable margins attached to software are in decline. From collaboration software to middleware to databases, margin oriented revenue models are under attack from volume focused alternatives. The precise competitive mechanisms may vary – cloud, open source, SaaS – but the result is a more competitive pricing market for software. While demand for software is more or less inelastic, credible free or low cost options almost inevitably lower the realizable revenues for software. The resulting lower margins are perfectly acceptable for volume based businesses, but much less for those built upon high margins such as IBM. The Company’s financial condition and operating results can be adversely affected by these and other industry-wide downward pressures on gross margins. To date, this has not been a problem for IBM. But this doesn’t mean it will not be in future, and if IBM’s to avoid being disrupted, it would do well to have contingency plans in place for the lower margin future that seems probable. Name one IBM software product less than 10 years old.